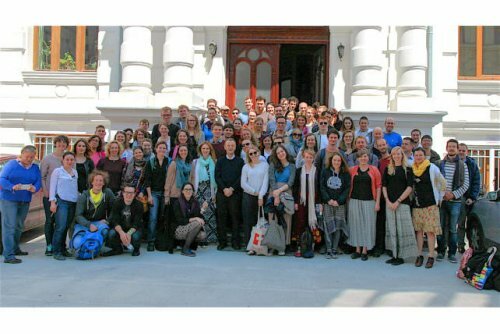 It’s the beginning of spring, and a group of young pilgrims from almost 20 countries is arriving in Bucharest, Romania. 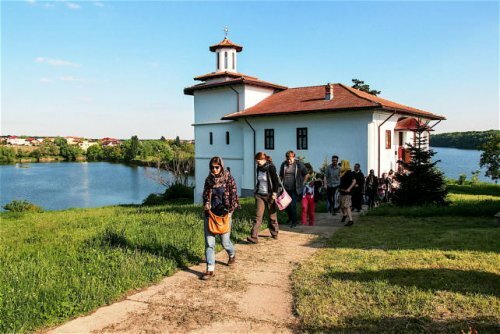 They’ve come to take part in a pilgrimage "to the wellsprings of Orthodox Christian faith", to discover the culture and traditions of Romania. Some are a bit shocked to find soaring temperatures when 1 or 2 hours before they left the other side of Europe in the snow. Some are exhausted after spending the last three days in a bus. But everyone is overwhelmed by the generosity of the welcome - from the warm, friendly smiles of the young people waiting for them at the airport, the amazing generosity of the young person who got out of bed at 4am to welcome people arriving by bus (and chase all over the city because the buses didn’t arrive where we expected them to! ), to the beautiful cakes made by the nuns from the Patriarchate: when Romania welcomes, it really pull out all the stops. Those who arrive early have the chance to explore this surprising city of contrasts: Medieval streets and grand modernist boulevards; futuristic offices and shopping centres stand next to monumental communist era apartment blocks, behind which are hidden literally hundreds of pretty little churches and monasteries full of beautiful old icons, wall paintings and a silence that seems barely possible after the noise of the busy streets nearby. In the evening: welcome in the host parish, a meal and getting to know the host family. After so many years of young people from Romania taking part in European Meetings, there were a lot of people wanting to finally take their own turn to welcome. But it was also wonderful to see many people who’d never heard of Taizé offering to take guests. Holy Week is not an easy time to welcome. As Romanians the hosts would like to offer the best food and lots of it. 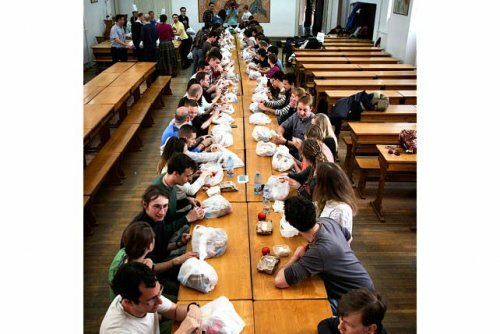 But for the Orthodox this is a time of fasting - not eating meat, fish, oil, other animal products, and on Friday and Saturday not eating at all if possible. The hosts were touched to hear that the young people would eat as they do. We were not just coming to watch their tradition from afar, but to join in with their lives for these few days. On Thursday morning, the first full day, we were all together for the Holy Liturgy (Eucharist) in one of the Patriarchal churches in the centre. Then after a typical romanian lunch of sarmale (stuffed vine leaves) and mămăligă (polenta) thursday afternoon was dedicated to discovering romanian culture. Bucharest has some wonderful museums and unfortunately we only had the time to visit one each. 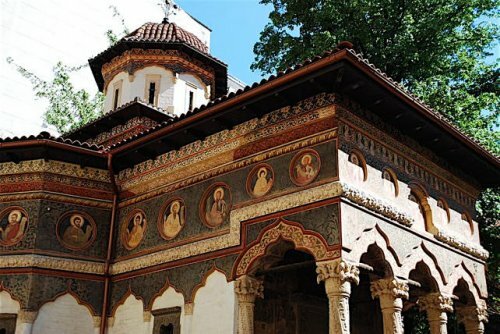 The Art and History museums are very well regarded and show that there is a depth of learning and culture in Romania that is maybe not well known outside the country. The Palace of the Parliament, symbol of the communist dictatorship, but at the same time a monument to the creative activity of an entire generation of Romanians, evokes different emotions from the people. But with all its impressiveness, it’s impossible to remain indifferent to it. 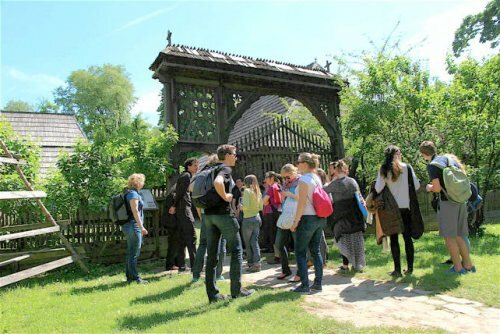 The outdoor "village museum" helped the group of pilgrims to imagine in a vivid way a typical Romanian village. How they used to live, but also how many still do. The heart of Romania is still in the villages and there is an important sense that without seeing one you haven’t really visited the country. 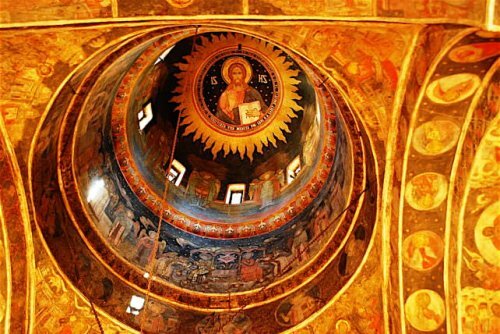 "Orthodox faith and worship is impressive! To discover it from a short distance was amazing but also not easy sometimes. The services touch every sense which makes you feel fulfilled but also exhausted after some hours. I am really so grateful for all these experiences in Bucharest." The darkness of the church, the silence of the people creates a strong atmosphere of prayer. The only light comes from the setting sun filtering down from the dome high above our heads. A few candles flicker here and there, the gold on the icons or threads woven into the priests’ vestments catch the light and sparkle. The priest begins to chant the first of twelve Gospel readings. As we allow Jesus’ last words to his disciples to wash over us (5 whole chapters from the Gospel of John) we enter, like those first disciples, into the drama of Jesus’ last hours. But it is not the horror and injustice of it all which confronts us. We begin the story by hearing about the love of the Father and the Son for each other and for us. This is the true sense of the cross, a supreme act of love. A day spent with the families and in the parishes: painting eggs, making traditional Easter cakes and other delicacies. 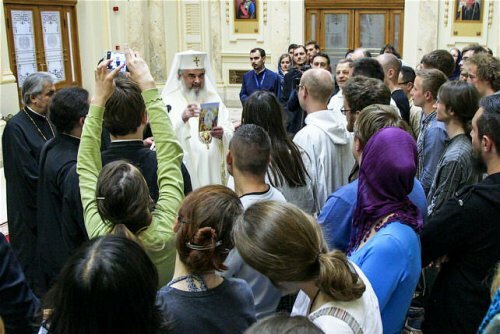 But along with the young people from the parishes and the Orthodox Youth Leagues of the different sectors of the city, there was also the chance to visit local social projects, places of hope and hidden treasure or just to visit elderly or sick people, as a simple sign of solidarity, sharing the joy of this greatest of feasts. Sometime during the day a table is placed in the middle of the church. The priests bring out the (cloth) icon of the Holy Shroud (the sheet used to cover the body of Jesus in the tomb). Placed on the table, each person comes in turn and passes beneath it 3 times – symbolically passing through the tomb with Christ, through death into new life. Watching people of all ages coming: the reverence they show, the efforts that some people who can hardly walk make to pass under the shroud is immensely moving. And the people come hour after hour, from morning until evening in some of the churches. And then, in the evening, we celebrate the Funeral of the Lord. Everyone sings together the great long hymn of lamentation and then we process with the icons of the shroud and the cross around the church. Everyone receives flowers to take home, symbols of that new life we are called to. In the Gospel, the women followed those who buried Jesus and "took note of the tomb and how the body had been laid. Then they returned and prepared spices and ointments. And on the Sabbath day they rested" (Lk 23:55-6). So we pilgrims to Bucharest rested too. At noon the picnic planned in the park had to be hastily moved to the Theology faculty because rain was announced. In the end there was only beautiful sunshine all day. But it meant that the planned reflection on the Icon of the Resurrection could be followed by looking at a fresco of it in the corridor. One of the brothers and two young theologians from the city helped us understand this icon of the "Descent into Hades". After a few days in the city, it was good to get out to visit the monastery of Cernica, built on two little islands on a lake just outside Bucharest. The beautiful setting and the friendly, humble welcome of our guide, one of the monks, made this the highlight of the pilgrimage for many. And then, rest: because tomorrow will be a very busy day! To say that it’s a long day is an underestimate! Easter Sunday literally begins at midnight (or even slightly before in some churches!). 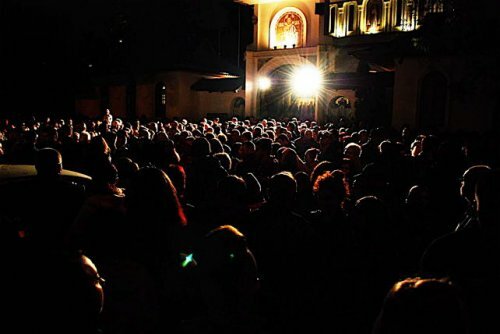 Huge crowds gather outside the church to receive the light of the resurrection to take to their homes. Maybe nowadays less people come to the church every week, but at Easter it seems the whole city has come. Everyone sings with great joy "Christ is Risen from the dead, trampling down death by death, and bringing life to those in the tombs." repeated over and over so that it enters into our hearts and we cannot forget it. 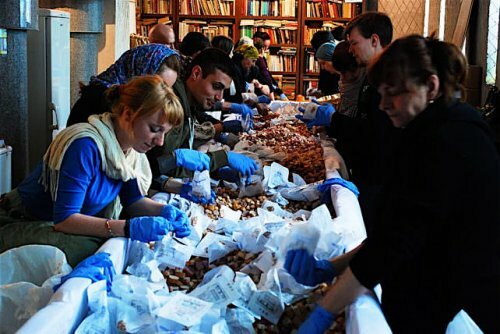 Then the Solemn Easter Eucharist – the communion seems to take longer than the rest of the celebration – so many people have prepared themselves. And at last we can eat again after 3 whole days (except that we are guests and so nobody would allow us to fast properly!). 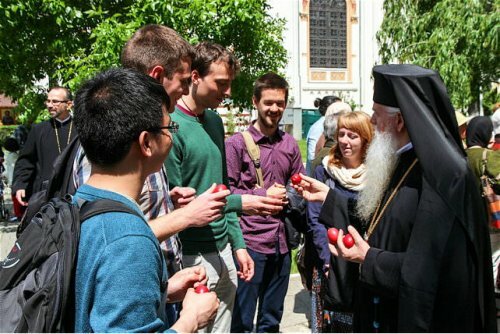 People are bumping eggs together and wishing each other "Hristos a înviat – Adevărat a înviat", "Christ is risen – He is risen indeed". They will continue to greet each other like this for the next 7 weeks until Pentecost. After a few hours sleep we are up again to join the Sunday services with Christians from other confessions. And then at midday: Vespers - the "Second Easter". The Gospel is chanted in 9 languages. And the Bishop speaks to the pilgrims in English, saving the tired translators. It’s a beautiful message that he has both for the local faithful and the visiting pilgrims: in Christ we come together, he makes us one, he wants us to be one. Then we need to run back to our host family’s place for lunch before coming back to the centre again to meet the Patriarch. His Beatitude Daniel welcomes us in the rebuilt "Hall of Christian Europe" – mosaics of Eastern and Western saints and church fathers circle the ceiling. He has words of encouragement for us – and of course something else to eat: "Pasca" - Easter cake. A walk across the city brings us just in time to the Roman-Catholic Cathedral for a final prayer with the songs of Taizé – everyone comes: the international pilgrims, young people from the city, the region and even further away, the volunteers and young people of the welcome parishes. And then, suddenly, it’s already time to say goodbye and take the road back home, to spread the Good News that Christ is truly risen!